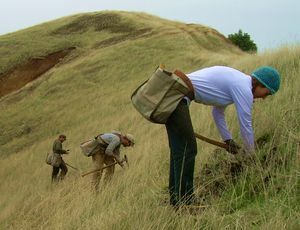 Almost all of the grasslands in the Mattole — some 27,000 acres — have come to be dominated by non-native grasses that were introduced by early settlers to the valley. Fire suppression has also greatly impacted grassland health; many historic grasslands have been lost to encroaching brush and conifers. Since fire suppression began some 60 years ago, there has been a 40% reduction of grasslands in the Mattole. 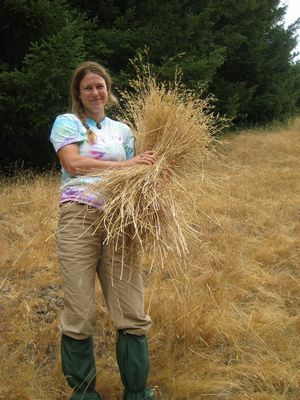 In order to address these issues, the Native Grassland Enhancement program seeks to gain a better understanding of the current state of grassland ecosystems in the Mattole watershed, and to preserve and enhance remnant native grass populations. Knowing where native and non-native grass populations exist in our watershed is integral to planning native grasslands enhancement projects. 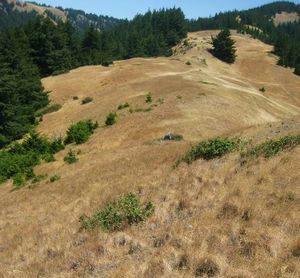 Since 2007 grasslands crews have surveyed over 1000 acres of grasslands in the Mattole and the King’s Range National Conservation Area (KRNCA). Survey data is used to track native grass collection sites, analyze trends in native and non-native grass populations, and to plan future native grasslands restoration projects. Native grass seed collection is the foundation for all of the grasslands work we do. We collect seed from existing native grass populations and propagate grass plugs in our Native Plant Nursery for use on our revegetation sites. Since 2007 the council has identified over 100 collection sites and collected over 120 lbs. of native grass seed. Our target species for collection include: Lemons needlegrass (Stipa [Achnatherum] lemmonii), California brome (Bromus carinatus), leafy reedgrass (Calamagrostis foliosa), California oatgrass (Danthonia californica), tufted hairgrass (Deschampsia cespitosa), blue wildrye (Elymus glaucus), big squirreltail (Elymus multisetus), California fescue (Festuca californica), Idaho fescue (Festuca idahoensis), junegrass (Koeleria macrantha), California melic (Melica californica), and purple needlegrass (Stipa pulchra). Revegetion sites are chosen based on proximately to existing native grass populations, soils, and absence of hard to control non-native plant species, with a priority given to recently burned sites. Over the past 3 years our grasslands crews have planted 35,000 native grass plugs on re-vegetation sites on Spanish Flat, Prosper Ridge, and Paradise Ridge. Although Douglas fir and most coastal scrub species are native to our watershed, they are considered invasive when they encroach on grassland ecosystems. The absence of natural fire regimes in the Mattole has resulted in a 40% loss of grasslands due to fir and coastal scrub encroachment. In order to prevent further encroachment of these species into our grasslands, field crews physically remove young trees through pulling and lopping. Sites that have native grass populations that are in direct competition with encroaching conifer and brush species are of the highest priority. 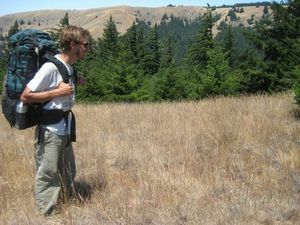 The Council also works with BLM-Arcata and the Lower Mattole Fire Safe Council to plan fuels reduction projects that help increase the size of existing meadows. When appropriate, native grass plugs are planted on newly reclaimed sites. All reclamation and re-vegetation sites are monitored to ensure plant survival and project success. Project sites are revisited every six months for two to five years after project implementation. Data is collected on plant survival, plant growth, and general changes in species composition. When necessary, sites are weeded to reduce competition with non native plants. For more information, contact Hugh at 707-629-3514 or hugh ‘at’ mattole.org. If you are interested in purchasing native grass seed or plugs for restoration, click here.